My legs are on fire, and my left hand is cramping up from holding on too tight. I’m breathing hard like I’ve just run up five flights of stairs, and it’s hard to see the track through the dust in the air and the mud spatter on my goggles. As I get ready to roll off the gas and throw the bike sideways, I quickly pray that I’ll make it around the turn and stay upright. I look left, trying not to focus on the mess of ruts, mud and dust I’m about to ride over. With my left foot out and sliding along the dirt I lean my upper body away from the turn and wrench the bike over. The front wheel skips and chatters over the ruts, but surprisingly never skids out. The back is another story. As I get on the gas coming out of the turn, the rear wheel kicks out quickly. I resist the urge to chop the throttle, and as I stay on the gas the back stops drifting out and starts to swing back in line behind the bike. I only have a few seconds before the whole sequence of events repeats itself again. I’ve spent all day doing the almost the exact opposite of everything I’ve ever done on a bike up until now. And I’m loving it. @superliza clocks in another hot lap. I’d always wanted to ride on the dirt, but living in the heart of Canada’s largest city, which itself is smack dab in the middle of one of the planet’s most paved over areas, I’d never really found the opportunity to make it happen. So when Ben called up and asked if I wanted to go to a flat track class my mouth said “yes” before my brain even finished processing the question. The historic town of Paris is supposedly one of the most scenic towns in Ontario, and I remember passing some nice old houses on the way in, but it’s not the scenery I’m interested in. 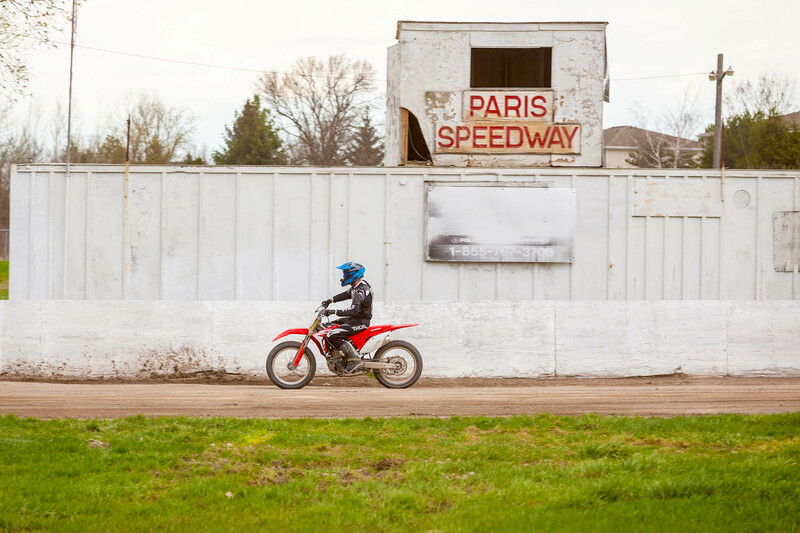 Paris Speedway, a little dirt oval that can’t be more than 50 meters on the long side, is home to the Go Flat Track team, and the place I’m going to learn how to ride in the dirt. After 2 hours sitting in traffic for what should have been a 1 hour drive, it’s good to get out of the car. Paris is the dustiest place. 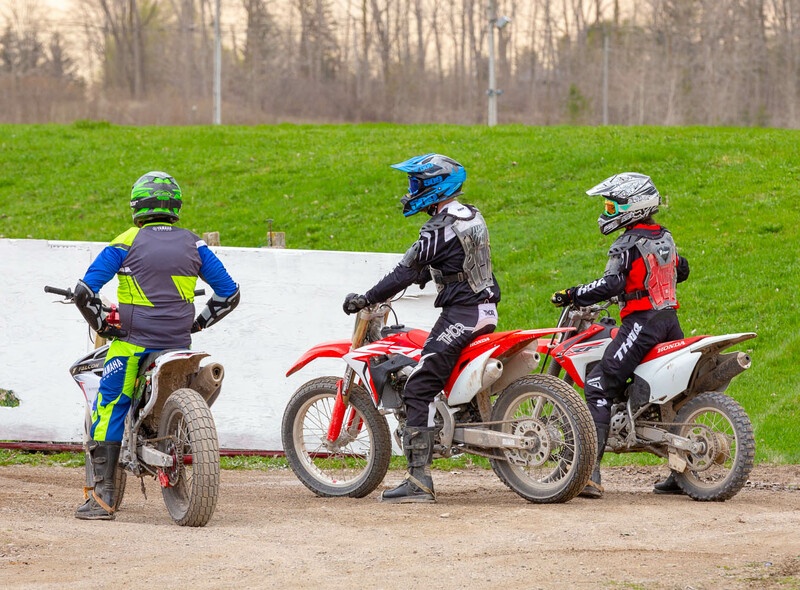 After getting decked out in what looks to be brand new motocross gear, we all take a seat and get ready to learn. It turns out there’s only a few things you can be taught in a classroom setting…the rest is practice. 1) Stance on the bike is key. You want to have your whole body sitting on the bike facing off to the left about 30 degrees. With your right cheek hanging off the seat on the right side, left leg sticking out to the left. 2) Your left leg is now hanging off the bike, with your foot sliding along the dirt. Visualize a right angle triangle on the dirt, your foot should be the top of a triangle formed by the 2 wheels and your foot. 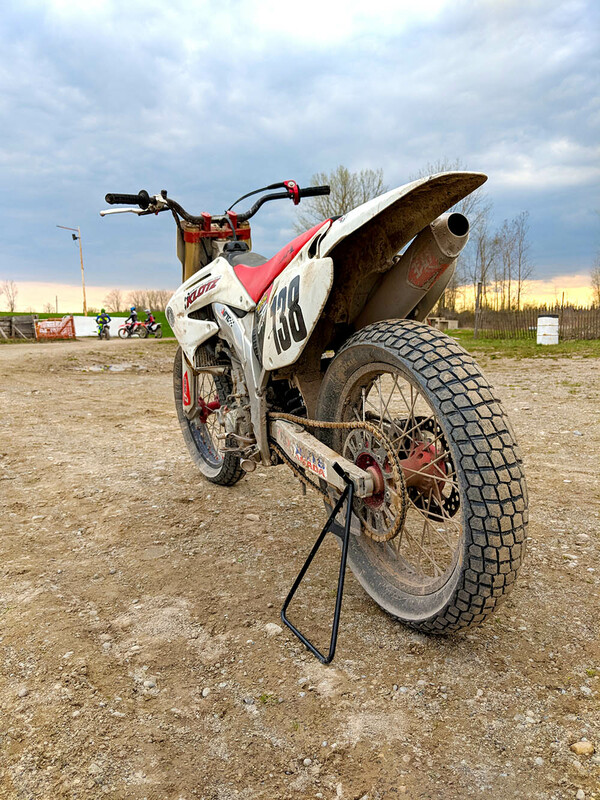 3) Unlike street riding where you lean into the turn, in flat track you want to keep your upper body as vertical (straight up) as possible, with the bike leaning over beneath you. 4) Coming into the turn you should come off the gas, lean the bike over, with your left foot sliding along ready to prop up the whole shebang if the front starts to go. As you come out of the turn and start to stand the bike up, shift your weight to the outside peg to load up the weight on the rear wheel. That’s basically it. In theory it’s pretty straight ahead. In practice it’s anything but. I’d never ridden on the dirt before, let alone even sat on a dirtbike. The big difference that stands out for me is that the pegs seem to be about 24 inches in front of what I’m used to, and every time I pull out and put go to put my feet on the pegs I have to quickly glance down do see where they are. Heading out for the first time I take it fairly easy. I have no idea how much traction I’ll have on the dirt, and no idea where the limits are. After 1 lap I can tell there is way more grip than I thought there would be, and I start to get a little more ambitious. A few more laps, each one faster than the last, and I start to feel ok. The bike is very comfortable, and it’s clearly made to do this job well. Now I’m starting to start to hang my leg out. It feels very wrong to be sliding my foot along the ground, the steel shoe makes a grinding sound as is rides over the dirt. It feels like I’m going pretty fast, but I know to an outside observer I must be going painfully slow. Soon enough the first track session is over, and I’m amazed at how much grip there is. As I get off the bike I can feel how much work my left leg / hip has been doing. Hanging out there for 15 laps with a 2kg steel weight on the end does take a toll. Waiting for the next session to start. Aaron gives us a few more pointers while we rehydrate and catch our breath, then it’s back out for the second session. This time round we’ve all had a bit of time to process how it should work, and everyone is circulating twice as fast as before. As I gain more confidence I start to enter turns faster, with the bike more leaned over. And as I start to get on the gas earlier and harder each lap, I start to feel something I’ve never experienced as a rider before; the back end swinging out. It wasn’t how I thought it would be. Instead of an angry snap as the back kicks sideways, I feel a much more subtle motion. As I gain confidence and give it more gas each time, it eventually starts to kick out harder and more unexpectedly. That’s when things start to become addictive. I find I'm getting acclimatized to this new way of riding, and I start catching up to riders who are ahead of me on track. Another new experience; getting completely covered in the mud thrown up from the riders ahead. Somehow this just seems natural, and I'm encouraged to push a little harder. I’m clearly not alone. As the day progresses, the group goes faster and faster, each rider trying to find the balance of speed and grip. A few riders find the edge, and push past it with varying degrees of suddenness (everyone who fell off was ok). My new favourite bike, a Falcon 450. I always suspected riding in the dirt would be an amazing experience, and I wasn’t disappointed. Of course the pros make it look easy, but it wasn’t difficult to get out there and get started. Aaron and the Go Flat Track crew provided a great way for a grizzled old street rider to get in on the fun, and I’m looking forward to heading out to Paris again soon to work on my technique. 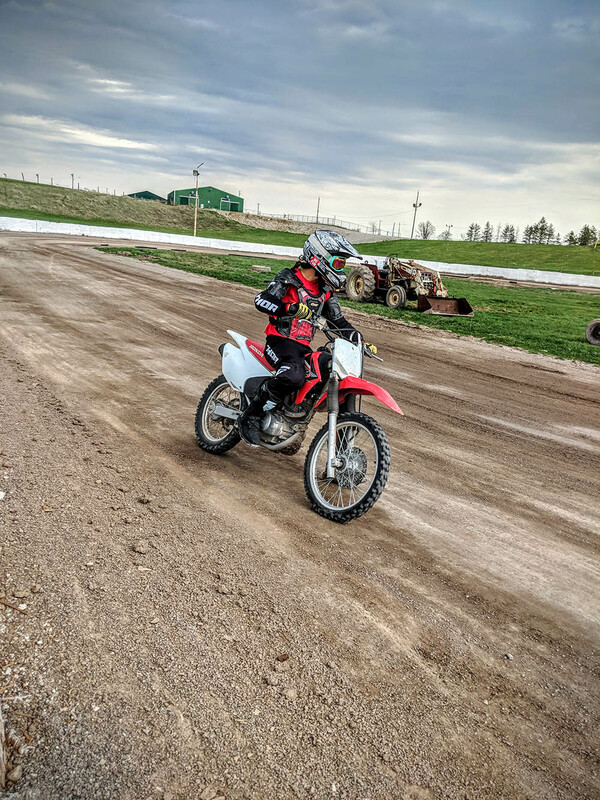 If you’ve always been dirt-curious but didn’t know where to go to experiment, look around for a local flat track school and give them a call.